Feeling Impulsive? Take Brammo's Empulse Electric Motorcycle For A Spin. Brammo‘s electric motorcyle, the Enertia, is about to get some faster, stronger siblings. The company’s new Empulse Trio line will feature bikes that can take you an average of 60, 80 or 100 miles on a full charge at speeds of up to 100 miles per hour. The Enertia, in comparison, can only travel about 40 miles on a full charge. “We found there was a range anxiety issue with the 40-mile range,” says Brammo CEO Craig Bramscher. Although the Enertia model has been available for about a year and a half, only a couple hundred are currently on the road. The company is working with a few Best Buy stores in Los Angeles, San Francisco and Portland to sell and service the bikes. Bramscher said he plans to grow the company internationally, especially in Europe and Asia, where the company will soon hire sales and distribution staff. While the Empulse’s maximum 100-mile range is too low for long distance travelers, it’s adequate for many commutes and everyday driving. It does require a motorcycle license, but most states allow you to test on the bike, so you don’t have to learn to shift gears while maneuvering a cone course. You can also skip regular motorcycle maintenance costs, like engine tuning and oil changes, and stop worrying about gas prices: a full charge will cost you about a buck. If you need a replacement part, the bike’s chain, tires and brakes can be replaced with those of a standard motorcycle. The bikes’ batteries can be charged either at a Level 2 charging station, or any standard (Level 1) power outlet. “Anywhere you can plug in a laptop, you can plug in the bike,” Bramscher says. Of course, you’ll need a little patience if you’re plugging it into a regular outlet. A full charge will take about seven to eight hours, in contrast to the two-and-a-half to three-hour charge at a Level 2 charging station—but there aren’t too many of those. If you’re wondering where you might find a Level 2 charging station, Brammo’s got an app for that. The app (initially for the iPhone, with an Android version in the works) will offer a realtime display of nearby charging facilities. The Empluse also features an iPhone port built into the bike. The Empulse Trio will cost $9,995 for the 6.0, $11,995 for the 8.0 and $13,995 for the 10.0 model with a 100 mile range. All three are eligible for federal and state tax incentives. 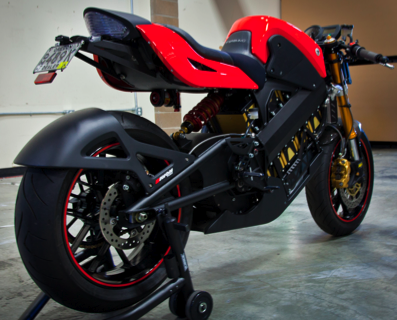 Brammo is based in Ashland, Oregon and raised $12 million in its August 2008 Series A round. Bramscher is gunning to raise $25 to $30 million for a Series B within the next three months.